It’s the results season again and the numbers rolled out by property companies are rather disappointing and point to poor take-up and an overall gloomy backdrop for developers. Most of the companies recorded a huge drop in sales, some by more than 50%, in their latest financial quarter compared with the same period in the previous year. The results are at least 5% below street estimates despite them having downgraded the sales and earnings expectations of property companies for the last two quarters since the middle of last year. Delays in construction works and slow sales are among the main culprits for the weak numbers. While potential buyers are taking longer to decide or even deferring their decision to commit to any major purchase, including buying a house for now, given the prevailing gloomy outlook in the economic front, most developers are also holding back project launches as they worry about low take-up rate. The extent of the adverse impact on developers depends on a few factors - size of unbilled sales carried forward from previous years, financial strength, creativity and product mix in their portfolio. Although the high unbilled sales, especially from record sales in 2007, are still contributing to the financial books of developers this year, they will be depleted soon if sales continues to slow. This year and to a certain extent 2010, property companies are still expected to turn in decent earnings due to the large unbilled sales brought forward from the last two years. However, if launches continue to be deferred and plummeting sales do not bottom out, earnings contraction post-2010 could kick in. Unless developers become more proactive and creative by adding more value and tweaking their product offerings to meet the changing market conditions, they will be in for many more quarters of underperforming results. Special promotions and easier payment packages by some developers have proved to be effective so far and contributed to higher sales for them. The right product mix is also important. Developers that are catering to the mass market and building more affordable housing are still recording quite decent sales while those with more high-end products are not as lucky this time. While Malaysia has been spared a hard landing unlike most of the developed economies which were hit almost instantaneously by the US-led global financial crisis, the poor financial results being unveiled show that the widening impact of the global financial crisis is already at Malaysia’s doorstep. Going by the extent of damages reported across the length and breadth of the globe, it will be a long and tedious road ahead for Malaysians. As one CEO puts it, it is now a question of survival for most companies and not about how much profit they are going to make. Companies have either drastically cut down on dividend payment or are not declaring dividend at all, in their quest to conserve cash for more rainy days ahead. Whether the prevailing low interest rates will be effective in reining in the slide in domestic demand and economy is left to be seen, especially when prices of food and fuel are still high, while the people’s confidence is at its ebb. Besides providing a lifeline to the various business sectors, the Government’s second stimulus package, or mini budget, to be unveiled on March 10, should focus on offering some direct benefits to the people to tide over their dire straits caused by the global financial upheavals. The focus should be to reach out to the people, especially the lower income group, including those who have recently lost their jobs due to companies that have downsized or ceased operations. To promote home ownership among the people, it will be most beneficial if the Government is able to meet the request by the Real Estate and Housing Developers Association to give a RM10,000 grant to first-time house buyers of property priced below RM300,000. Granting full stamp duty exemption for property transactions will also be another effective measure to lower transaction cost for the people. ·Deputy news editor Angie Ng hopes that by casting the stimulus net as wide as possible to reach the needy business sectors and the common folk, the Government’s money will be well spent when all Malaysians rally and work together for a fast track recovery of the economy. And the funds have to be disbursed quickly to be effective. Licensed auctioneer and auction firm Ng Chan Mau & Co Sdn Bhd general manager Foong Chon Wai’s schedule has been pretty tight since the beginning of the year and he is expecting to be even busier in the coming months. “The number of properties up for auction has increased by 5% to 10% since September last year mainly due to foreclosures and we expect more to come as banks’ non-performing loans increase,” he says. This could be the scenario going forward for the property auction business as the current economic downturn takes a toll on the ability of property owners to service their mortgages, resulting in more properties going under the hammer. A sale by public auction is a way by which properties are put up for sale by their beneficial owners, usually a financial institution. Prospective buyers for the properties will gather at the auction venue and put in their bids or offers for the properties that they are interested in. The bidding will stop when the highest price is called out three times by the auctioneer when no further bids are made. The person who submits the highest bid will be declared the buyer for the property. Foong, who has some 20 years’ experience in the auction business, expects to see an increase in lower-end properties (RM50,000 and below) coming up for auction in the coming months as the lower income group is the most affected by the economic downturn. Leong Auctioneer Agency has also experienced an increase of 10% to 20% in the number of properties going for auction since October last year. Owner and licensed auctioneer Leong Wye Hoong says more high-end condominiums, in the range of RM250,000, in the Kuala Lumpur city centre (KLCC) have been going under the hammer since the beginning of the year. Many of the owners of the properties are expatriates who are looking to get rid of their properties while the prices are still high, he adds. Condominiums in the KLCC vicinity are currently selling for RM1,200 to RM1,500 per sq ft versus RM700 to RM800 some three years ago. “Prices for such properties have gone down by 10% to 20%. We have a handful of condominiums in the KLCC area up for auction next month and more may be coming up as borrowers default,” Leong cautions. He foresees prices going down by as much as 30% for the condominiums, going forward, as supply currently exceeds demand and prices need to be low enough to attract bidders. Nevertheless, Foong does not expect the price of certain properties such as landed residential properties, commercial properties such as shoplots and industrial properties, including factories and agricultural land, to come down as demand for such properties is still strong. Properties which are not in demand in places such as Bukit Beruntung, Nilai, Rawang, Mantin and Bangi could see prices pushed down further, he notes. “In the past two months, people have become more cautious when buying property. They do not simply buy properties anymore and will normally wait for the properties to hit below market price first. “This year we expect properties which are not in demand, especially due to their locations, to go through two or three auctions before they start attracting bidders,” he says. Properties going for first auction will have a reserve price that is the market value of the property but the price will decrease by about 10% in every subsequent auction if there are no takers. “There are opportunities for buyers looking to pick up properties in an auction, especially in such bad times, as they may find a rare property which will not be auctioned in better times. “Such properties will attract lots of bidders but if a buyer does not mind paying a bit more than the market price, he should be able to snap it up,” Foong says. Some auctions that Leong had handled recently even made quite a bit of profit for their owners – a shoplot in Bangsar generated a surplus of over RM300,000 from an auction while a piece of industrial land in Gombak made a surplus of over RM700,000. Auctions have also become popular as people are more aware of the benefits of buying auctioned properties. Foong believes that property buyers can get pretty good deals in terms of pricing via property auctions. “Auctions also enable the transaction to be done in the open and in a very transparent manner,” he points out. Leong says auctioneers are now more innovative in their marketing efforts to attract bidders to their auctions. “We do not just put up notices in the surrounding areas of the properties but also distribute flyers, put up the property details on our website and even have roadshows to inform potential buyers of when and where a certain auction will take place,” he says. A PUBLIC auction could be a way for property buyers to snap up properties at a bargain but the auctioneers’ advice is for buyers to do their homework first before buying an auctioned property. Obtain a copy of the condition of sale and seek independent legal advice on it. Prospective buyers should inspect the property they are interested in by looking at the external facade and location first. The property interior may not be available for viewing. It is not a requirement for auctioned properties to come with vacant possession. Prospective buyers should consult banks on the loans available for the auctioned property to ensure that financing will not be a problem. An official individual title search at the relevant Land Office or other relevant authorities should be conducted on the property to ensure that an individual/strata title has been issued and that there are no caveats attached. Make the necessary enquiries with the developer, proprietors and other relevant parties to confirm the terms and conditions of the sale such as whether the sale is open to all races or to Malaysian citizens who are bumiputras only. The Housing and Local Government Ministry will think of ways to provide more incentives for developers to ensure that the construction industry remain resilient despite the faltering economy. Its minister, Datuk Seri Ong Ka Chuan, said the ministry would review the stamp duty and taxes to ease the burden of the developers in building more houses. The ministry will monitor the situation and find ways to stimulate the construction industry, he told reporters after presenting the keys to the owners of Milan condominium in Damansara Perdana in Petaling Jaya today. "Besides allocating RM100 million for the Housing Credit Guarantee Scheme this year to enable those without proof (statements) of income to obtain ahousing loan, we will think of other incentives," he said. Ong said housing developers should build more low- and medium-cost houses to help keep the construction sector buoyant while those, who had completed their projects to price the houses at reasonable prices. He said the ministry would continue to promote the ''Malaysia My Second Home''programme by enticing foreigners to buy houses priced above RM250,000. Ong said it is important that the construction industry remain resilient to avoid retrenchment in the sector. ADRIAN Symons, director of M Moser Associates Sdn Bhd, a creator and designer of office space, has his desk by the window. It is a space he shares with 10-odd staff, with desks next to each other. There is no room for confidential chats on the phone line. If there is anything private and confidential to be said, there is always the meeting room. Although Symons is heading the office, he believes that the room for the boss with the huge desk in the centre is more hierarchical than anything. “The office has gone egalitarian. The pantry is a space to encourage people to meet and chat over coffee and exchange information, not so much as a place where people take time off work. A client, with a three-storey building, did not want a lift. They wanted people to meet on the stairs. Barriers are being removed to encourage interaction between co-workers and between management and workers,” says Symons. In some offices, the pantry is located at the front to create a sense of warmth, that this is a friendly place to be in. A lot of information can be exchanged over coffee, not to mention relationships are being formed which promotes the general office environment. Increasingly, barriers are being removed in the office environment. “Contributing to this exchange of information is the use of technology in the work place. And technology will lead the way,” he says. Some offices have strings of meetings rooms which are not used, or may have huge meeting rooms. “How many people meet? How many meetings and their duration? These factors should be considered to determine what is needed. In some cases where two companies share a floor, is it possible to share the meeting rooms and free up space? “Most trends in the office space environment is led by technology. A person goes to the space for a function. In some offices, there is no designated space for people, just space to perform a function. People, or the software, and technology will have to meet and housing both of these is the building, which is part of the hardware. “Generally, clients have already pre-determined a building before they seek our services. They benefit more if they speak to us before they commit to a building. We also help with the pre-leasing stage, says Symons. In Malaysia, where offices can be located in a two-storey shoplot or a more sophisticated office tower, there has to be a certain degree of efficiency in terms of space, taking into account how people work today and the evolving office technology. Besides the laptop and mobile phone, there is a plethora of office gadgets to help us communicate. “How we use space and technology depends to a great extent on how IT, human resources and accommodation (the building we occupy) come together. But of late, a new trichotomy has emerged and this comprises security, marketing and branding and corporate identity. Huge amounts are spent on branding to keep a service or product in the minds of customers, but many in top management have forgotten that the space a company occupies can itself be part of the branding process. And this is where strategic planning of a building comes in. “Different buildings have different efficiency, with some being more suitable for some industries than others. How an office is designed or how space and colours are used are part of the branding process,” says Symons. Build the building inside out. Let the interior drive the architecture. The outside of the building is not used but it is the interior that is used. That is what is meant by a purpose-built building, a structure designed and laid out according to the needs and requirements of the client, says Symons. A German chicken feed company bought two pieces of land. They wanted to build an office and storehouse/warehouse. We build the building inside out; three-storey on a rectangular piece of land at the end of which is the warehouse. The interior drove the architecture. They did not want lifts because they wanted the staff to mix and meet on the stairs and on the floor, says Symons. Besides contributing to the branding and image of the company, a well-designed and cheerful office can also be a significant factor in retaining existing staff and attracting new ones. While it may sometimes be impossible to change what is already bought or leased, it is, in most instances, possible to make the best of what’s available. “Not all buildings are equal. Some may be more suitable for certain industries compared to others. Fitting out a building is a costly affair. So by a process of elimination, you arrive at the best option or you work with the architect,” he adds. SHAH ALAM: There is evidence that demand remains resilient in the property sector although housebuyers are becoming more prudent amid the economic slowdown, said Malton Bhd. “Our property development in Puchong for example is still having good sales where terrace houses recorded good take-up (rates). Our commercial development is also doing quite well too,” said sales and marketing director Tracey Lai after a signing ceremony between Malton and hypermarket group Carrefour here. Nevertheless, Lai acknowledged the property market was getting more challenging. “Buyers are looking for houses that are worth buying, good location and now, they are comparing products offered by the developers before choosing the right one. “As for us, we are fortunate to have good locations for our developments such as Bukit Rimau township and with new financial packaging strategies offered to buyers, we hope to facilitate their purchase at this time of difficulty,” she said. Malton executive director Hong Lay Chuan said apart from building a new Carrefour at Bukit Rimau, a new hospital by Columbia Asia Healthcare will also be built there. “We have about 50 acres of commercial land that are still undeveloped here at Bukit Rimau and with the development of the new hypermarket and hospital, our development here at Bukit Rimau is nearly completed,” he said. ABU DHABI: Abu Dhabi property developer Al Maabar International Investments said yesterday that it plans to build a US$10 billion (US$1 = RM3.67) development in Jordan to help create jobs and develop the local economy. The joint venture, which includes Aldar Properties and Sorouh Real Estate, said the waterfront real estate and tourism development, one of the biggest private sector investments in United Arab Emirates (UAE), would be in Aqaba on the Red Sea coast. The group, which last April announced it would build a US$5 billion project in Jordan, said it would begin construction on the residential, tourism and commercial project in the first half of 2010 and aimed to create 15,000 jobs. Al Maabar said it signed the deal with Jordan to acquire 3.2 million sq m of land in Aqaba for US$500 million for the development. During the six-year boom in oil prices that ended in mid-2008, the capital of the UAE amassed hundreds of billions of dollars in surplus revenues from oil exports. Abu Dhabi, facing a slowdown as oil prices slump, his week launched a US$500 million takeover bid for Canada's Nova Chemicals. Aldar and Sorouh each own a 30-per cent stake in Al Maabar. Reem Investments, Reem International, Al Qudra Holdings and investment firm Mubadala Development Co hold the remaining stakes. GEORGE TOWN: Plenitude Bhd is ready to spread its wings in Asia. The listed developer, which reported a record net profit and revenue of RM78.6mil and RM347.8mil respectively for the financial year ended June 2008, is looking for the “right price and right location” in neighbouring countries, says executive chairman Chua Elsie. “In the next one or two years, we will be embarking on projects in other Asian countries but we are still looking to expand our land bank in Malaysia; that is our priority. “Plenitude has about 1,619ha in Malaysia, of which half is undeveloped,” she said, adding that the company had some 810ha of undeveloped land in Johor Baru, Klang, Sungai Petani and Penang. “We are scouting around a few places on Penang island to increase our land bank,” she said in a recent interview. On Plenitude’s recently launched Bayu Ferringhi development, Chua said the freehold project, comprising 44 luxurious semi-detached villas and 112 condominiums, would be built on 4.45ha at Jalan Batu Ferringhi. Prices start from RM1.76mil for the villas and RM761,000 for the condominiums. The project, to be undertaken by wholly-owned unit Plenitude Heights Sdn Bhd, will incorporate a tropical resort lifestyle theme. Chua said the new development was “especially significant” as it was Plenitude’s maiden property development here. “Although we have been very active in other states, it took some time for us to embark on a project in Penang because land is scarce here. “We had to wait a long time for the ‘right’ piece of land and as soon as we got it, we launched Bayu Ferringhi,” she said, adding that despite the economic challenges, response had been encouraging. “Whether times are good or bad, people still need a place to live. We are offering low-density, value-added property located at prime location, so we are confident. “About 30% of the villas and condominiums are already reserved by purchasers and there have been many enquiries from locals and foreigners,” she said, adding that the gross development value (GDV) for Bayu Ferringhi was RM200mil. The developer is targeting prospective buyers from Hong Kong, Britain and Europe to invest in its property under the Malaysia My Second Home Programme. 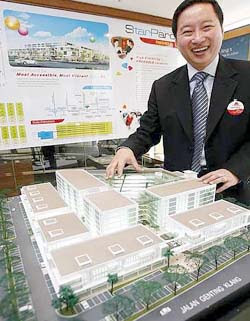 Plenitude chief operating officer Khoo Yek San described the condominium units as the state’s first and only “bungalows in the sky”. “This project is special. The units are detached from each other, so it is like you are living in a bungalow in the sky,” she said. She added that Plenitude, which also owns the Tanjung Bungah Beach Hotel here, would be developing its 0.76ha parcel next to the hotel next year. “We expect a GDV of RM200mil from that project and are considering serviced apartments although nothing has been firmed up yet,” she said. SHAH ALAM: SP Setia Bhd’s recently launched 5/95 Home Loan Package has achieved better-than-expected sales of RM300mil amid the softening economy, said group managing director Tan Sri Liew Kee Sin. From left: SP Setia executive director Teow Leong Seng, chief financial officer Yap Kok Weng, chairman Tan Sri Abdul Rashid Abdul Manaf and Tan Sri Liew Kee Sin at the briefing. “At that point in time, we did not specify a target because the market was so bad. We wanted to test whether this (5/95 programme) will work, and apparently it works very well. “RM300mil sales in less than two months is very good,” he said after the company AGM yesterday. The RM300mil sales figure was based on bookings made, he said. Launched on Jan 19, SP Setia’s 5/95 Home Loan Package allows buyers to pay only an initial 5% of the price of the house while all legal fees and stamp duty on the sales and purchase agreement, among other benefits, will be borne by SP Setia. The package is available until April. SP Setia has targeted RM1.1bil in revenue for its financial year ending Oct 31 (FY09). It has already chalked up RM400mil in sales so far. Meanwhile, the developer said its RM2bil Eco Lakes township in Ho Chi Minh City, Vietnam, would be launched next month as planned. SP Setia has a sales target of RM100mil in FY09 for the 558-acre residential property development, which will take at least 10 years to complete. In April, it will launch its first high-rise project, Setia Sky Residences. The luxury serviced apartments project, located at the intersection of Jalan Tun Razak and Jalan Raja Muda Abdul Aziz in Kuala Lumpur, has a gross development value of RM800mil. The company has targeted to achieve RM200mil in sales for this project in FY09. Asked if SP Setia would be interested in any merger and acquisition (M&A) plan, Liew brushed off the idea. “M&A doesn’t make sense right now unless the company has a lot of good landbank, but most companies that are in trouble do not have much land left,” he said. To date, Liew said the company had unbilled sales of RM1.2bil and a landbank of about 4,000 acres. The company would maintain its dividend payout ratio of 50% of profit after tax, he said. SHAH ALAM: SP Setia Bhd, Malaysia’s most valuable property developer, may begin harvesting maiden returns from its initial overseas venture in Vietnam as early as the current financial year ending Oct 31, 2009 (FY09). This is in anticipation that the developer will rake in some RM100 million worth of landed residential property sales in the Indochina nation. “We will work very hard to achieve this RM100 million (sales). We have never sold anything in Vietnam so far,” SP Setia group managing director and chief executive officer Tan Sri Liew Kee Sin told reporters after the company’s shareholders meeting here yesterday. In June 2007, the developer entered into a joint venture agreement with Becamex IDC Corp and Treasure Link Far East Ltd to develop several parcels of land with a combined area of 226ha within the My Phuoc enclave of Binh Duong province. The tract where SP Setia’s estimated RM2 billion EcoLakes at My Phuoc mixed development will be undertaken, is located 40km north of Ho Chi Minh City, and is about an hour’s drive from the Tan Son Nhat international airport. Income from SP Setia’s ventures abroad is deemed timely. This is because the Malaysian real estate sector is heading to a downcycle, and the effects have hurt local property developers’ earnings. But Liew said the firm would continue to reward shareholders with a 50% dividend payout from its annual net profit. While its latest set of financials had emerged weaker, it is worth noting that the developer has existing unbilled property sales of about RM1.2 billion which could sustain earnings in the next two years. Unbilled real estate sales refer to the value of properties sold which is yet to be recognised in a developer’s books. SP Setia has some 1,600ha of undeveloped land in Malaysia, and another 240ha in Ho Chi Minh City. “We will focus on looking for good land to buy,” said Liew. Meanwhile, SP Setia’s “5/95 Home Loan Package” has already yielded returns. Since its launch last month, the scheme has raked in some RM300 million worth of property sales so far, according to Liew. “It’s beyond our expectations. The RM300 million sales involve landed properties across the board,” Liew said. During FY08, SP Setia sold RM1.404 billion worth of properties. But FY09 figures could be lower at some RM1.1 billion against a backdrop of weaker economic outlook, according to Liew. On the whole, SP Setia’s earnings fell in FY08. Net profit was down 17.9% to RM213.46 million from RM260.07 million in FY07 on lower gross profit margins, partly due to costlier building materials. Revenue, however, rose 15.7% to RM1.33 billion from RM1.15 billion. Shares of SP Setia ended 1.2% or four sen lower at RM3.30 yesterday, for a market capitalisation of RM3.36 billion. A total of 721,600 shares were traded. The stock has gained 6.45% so far this year, outperforming the Kuala Lumpur Composite Index’s 2.25% rise. PETALING JAYA: The local property market would be able to escape a bubble, such as the one affecting neighbouring countries, several industry experts said. They said the local property market would be resilient in facing the current downturn as it was mainly driven by domestic demand. A roundtable discussion on Corporate Real Estate Investment Opportunities organised by Zerin Properties that was posted on its website www.zerinproperties.com yesterday, the panellists agreed that the real estate market, particularly the residential sub-sector in well-located areas in the Klang Valley, continued to be attractive to both local and foreign investors. According to International Real Estate Federation (FIABCI) Malaysia president Datuk Richard Fong, the property market did experience a “slight bubble” in the high-end sector in Kuala Lumpur, particularly in KLCC, Mont’Kiara and Hartamas where property prices had doubled over the last three to five years. Fong said there were good deals to be had in the condominium market in Kuala Lumpur city centre, especially those priced between RM800 and RM1,000 psf. “One should grab when you find sellers looking to cash out at a 30% discount from the property’s peak price,” he advised. The roundtable discussion was moderated by Hall Chadwick Asia Sdn Bhd chairman Kumar Tharmalingam. The panellists also said that the liquidity in the marketplace, innovations by developers and the Malaysia My Second Home programme also increased the attractiveness of real estate. They observed that investing in real estate investment trusts (REITs) was also becoming popular as an alternative form of investment. Axis REIT chief executive officer Stewart LaBrooy felt that investors found REITs attractive due to their hassle-free nature and high yields which could easily reach 12%. On the commercial office sub-sector, the panellists agreed that KLCC’s iconic Petronas Twin Towers landmark remained attractive to large multinational corporations. Previndran said rental rates in KLCC were not expected to “fly” due to sustainable demand. However, the office market could get a bit soft in Petaling Jaya with new supply coming from PJ8 and V Square while rentals are stable in micro locations like Damansara Heights and Bangsar. IF, like me, you’d far rather commute an hour than change your baby’s nappy, then the idea of working from home surrounded by your IT gizmos is dead in the water. It always was a silly New Age idea anyway. I can’t speak for the female side of the equation, but a man’s office defines his purpose in life. You don’t slog three years at university just for the privilege of locking yourself in a cubby hole under the stairs at home waiting for e-mail. Maybe that’s an acceptable way of life for asylum seekers and IT consultants but real human beings need real human contact. The office is your club, your camp fire and your hunting ground. It opens up opportunities for matrimony as well as career advancement. As an employer, I can’t imagine promoting a dehumanised digit living the life of a troglodyte. I’d rather promote my Blackberry. When it comes to office location, there is now a happy medium between city and suburb. Up until the late 1980s, if you had an office in PJ your name was probably Klaus and you traded heavy switchgear for a Bavarian gesellschaft. You probably had a beard. Now some perfectly normal people work in PJ, and Jalan Semangat is transforming into a second St Kilda Road. Take a look at the new Quill building there. It’s superb. Around the Twin Towers can be found some excellent buildings, including Menara Maxis and Menara Citibank. They are also Grade A and are currently clocking up rents of RM8.50 to RM9 per sq ft per month. This shift in focus to around KLCC which occurred in the late 1990s was at the expense of the original Jalan P. Ramlee/Sultan Ismail/Raja Chulan area which, in some sections, is now becoming viewed as secondary. This is largely attributable to traffic congestion. Areas of the Golden Triangle which are gaining popularity include the Tun Razak/Jalan Ampang intersection which has both traffic accessibility as well as an LRT. Here you will find new buildings such as G Tower and The Icon coming up, offering a million sq ft of new space. Damansara Heights has been a popular office location since the 1960s but other decentralised areas began to take off about the time of the first Proton Saga. There is now just over 24 million sq ft of office space in the Golden Triangle but decentralised areas, including KL Sentral and Mid Valley, have rapidly grown to 20 million sq ft and in other suburban areas along the Klang Valley, you will find 65 buildings with another 12.4 million sq ft. In other words, the Golden Triangle is losing significance. Kuala Lumpur City Hall is presumably satisfied with this shift which is partly the result of its freeze on new office buildings in the Golden Triangle over 20 stories, imposed since 1997. As the city grows, new commercial hubs will evolve and it is a continuing challenge for our planners to guide private enterprise without stifling initiative. Further north from 1 Utama, Mutiara Damansara is fast becoming an office destination and has 500,000 sq ft of space either completed or under construction. And further north, Damansara Perdana is completing four office towers totaling 800,000 sq ft net and the take-up has been excellent. This was a bold project when it was inaugurated three years ago, and underlines the potential for office space in the suburbs if you get your location and timing right. It is a pity that the new LRT lines now have difficulty in keeping up with this radial development. In the US and Australia, it was development that followed the rail lines, and not vice-versa. Nevertheless, the new LRT linking Kota Damansara with the city will be a boon. It will roughly follow the direction of Jalan Damansara. Let’s hope they can keep the traffic flowing underneath while they build it. I don’t want to have to stay at home. EDINBURGH: London lost its ranking as the world’s most expensive city for offices in 2008, supplanted by Hong Kong and Tokyo for the first time in nine years. Falling rents in the UK capital, combined with the pound weakening against the euro brought occupancy costs for prime offices in London’s West End down 23 per cent to ?1,403 (?1 = RM4.70) per sq m annually, New York-based property broker Cushman & Wakefield Inc said in a report yesterday. That compares with ?1,743 per sq m in Hong Kong and ?1,649 in Tokyo.The global financial crisis pushed rents lower in 16 per cent of the world’s biggest cities as financial companies fired workers and cut back on the space they lease, Cushman said. Worldwide mortgage-related losses and asset write downs total more than US$1.1 trillion (US$1 = RM3.67). London “has now felt the full impact of the credit and banking crisis,” Cushman said. Costs fell 4 per cent in Hong Kong compared with a year earlier and declined 19 per cent in Tokyo. “There seems little doubt that rents will continue to fall over 2009, perhaps at a faster rate than before,” said John Siu, general manager, Cushman & Wakefield Hong Kong. Cushman & Wakefield surveyed 202 locations in 57 countries. Rents climbed 3 per cent globally, the smallest increase since 2004, the broker said. Rent accounts for the bulk of occupancy costs, which also include service charges and property taxes. Moscow, Dubai, Mumbai, Paris, Damascus, Singapore and midtown Manhattan rounded out the 10 most expensive locations for offices. Dublin fell to 15th, ranking it out of the top 10 for the first time in three years. PROPERTY developer SP Setia Bhd is aiming for RM1.1 billion in sales for the financial year ending October 31, 2009, despite the challenging economic situation. It also expects to make RM100 million in sales in Vietnam for its property project, Setia Eco Lake, to be launched next month, managing director and chief executive officer Tan Sri Liew Kee Sim said. To date, sales has already reached almost RM500 million, he told a press conference after the company's annual general meeting in Shah Alam today. He said its landed property in Vietnam had a gross development value of RM2 billion over the next 10 years. The group has nine ongoing projects located in Johor, Penang and Selangor. Meanwhile, Liew said the group made RM300 million of its sales over the past several months from its 5/95 home loan package. Under the package, property buyers pay five per cent upfront the purchase price of the property they are buying from the company while the balance 95 per cent is paid when the property is completed. "It is a very good success rate and beyond our expectation," Liew said. On Bank Negara Malaysia's decision to reduce the Overnight Policy Rate (OPR) by 50 basis points to two per cent yesterday, he said that it was a good move for the property sector. With the rate down, property will be a good buy and "I think the property market will come back very strongly," he said. Liew said the company, which had a land bank size of 4,000 acres, was also on the lookout for good land or company with very good landbank, although it was not making any acquisition at the moment. On its first high-end condominium project, Liew said the Setia Sky Residence in Kuala Lumpur City Centre is expected to be launched in April with gross development value of RM200 million. KPJ Healthcare Bhd will inject more properties into its Al-'Aqar KPJ REIT (Real Estate Investment Trust), said its chairman, Tan Sri Muhammad Ali Hashim. He said the properties comprised Seremban Specialist Hospital; Taiping Medical Centre; Kota Kinabalu Specialist Hospital; Bukit Mertajam Specialist Hospital; KPJ Penang Specialist Hospital; Tawakal Hospital; KPJ TawakalSpecialist Hospital; and, KPJ International College of Nursing and HealthSciences. "The exercise involves a total purchase consideration of RM293 million which will be satisfied by cash of RM176 million and by the issuance of 123 million new units in Al-'Aqar KPJ REIT at 95 sen apiece," he told a media briefing after the company''s extraordinary general meeting in Johor Bahru today. Muhammad Ali said KPJ was confident the healthcare industry would be resilient and withstand the present global economic slowdown. He said the Al-'Aqar REIT would allow KPJ to unlock the values of the assets and allow it to reinvest the funds into the group as well as to reduce borrowings. "The REIT will give us the flexibility to use the funds for potential acquisitions, mergers and reinvestments into new and existing hospitals," he said. Muhammad Ali said for the year ended December 31, 2008, KPJ's pre-tax profit rose by 12 per cent to RM23.7 million from RM21.1 million in the same period of 2007. Revenue rose by seven percent to RM325 million from RM304.6 million in thesame period of 2007, he said. Mah Sing Group Bhd registered a drop in its net profit for the fourth quarter to RM16.54 million compared with RM20.49 million recorded in the same period last year. Fourth quarter revenue, however, was higher at RM151.66 million from RM120.4 million in the previous corresponding period. For the full year ended December 31 2008, the lifestyle developer recorded a net profit of RM92.95 million compared with RM82.26 million in 2007, while revenue grew to RM651.64 million in 2008 from RM573.36 million the year before. In a statement, Mah Sing said the growth was driven by its commercial and residential projects in the Klang Valley and Johor Baru. Its plastic division also continued to reap good earnings. Managing director Datuk Seri Leong Hoy Kum said the group racked up credible sales of RM395 million in 2008 due to it focus on the needs of each of its niche markets. He said the group should be able to sustain momentum in 2009 by offering medium- to high-end residential and investment grade commercial projects. The group will continue with innovative marketing strategies such as tying up with financiers. Its easy home ownership programme has garnered more than 1,500 enquiries contributing to sales of about RM140 million. New launches in 2009 will include 30 units of garden bungalows in the Klang Valley and will be priced from RM1.2 million per unit. A first and final dividend of 16 per cent or 8 sen per share for the financial year ended December 31 2008 has been recommended. This represents a minimum payout of about 41 per cent of its net profit. PETALING JAYA: Mah Sing Group Bhd has posted a drop of 19.7% in net profit to RM16.45mil for the fourth quarter ended Dec 31, compared with the previous corresponding period. At the same time, revenue in the quarter grew 26% to RM151.7mil. Despite the weaker quarter, the company registered 15% growth in after-tax profit after minority interest to RM93.2mil for the full financial year. In a statement, the company said contributors to the financial year included the group’s commercial projects, The Icon Jalan Tun Razak and the Southgate Commercial Centre, and several residential projects in the Klang Valley and Johor Baru. It also said it could “hypothetically raise an additional RM500mil to reach an optimal gearing level of 0.5 times,” giving it a war chest of RM900mil, including the existing cash pile, for expansion. Like many other asset classes, Malaysia’s real estate investment trusts (REITs) have been sold down and are trading below their net asset values (NAV), made worse by the softening property market and weakening rent yields. The challenges facing REITs is not only the negative market sentiment towards equity, but also the inability to raise capital due to tightening credit. Despite the challenging economic conditions this year, REIT managers in the country are confident they can mitigate the impact by looking at various options to raise capital, acquiring properties prudently and focusing on existing assets to ensure strong tenancy. Axis REIT Managers Bhd chief executive officer and executive director Stewart LaBrooy said part of the growth process of a REIT was to continuously acquire properties to enlarge its portfolio. He said Axis REIT would not discount the possibility of future acquisitions this year although it may not be as intensive as 2008. “But any potential acquisitions will need to be yield-accretive,” he told StarBiz. With the reclassification of Axis REIT as syariah-compliant last December, the REIT hoped to appeal to a broader investment base of both conventional and syariah funds locally and abroad to facilitate Axis REIT’s future capital raising exercises, he added. Currently, Axis REIT’s focus is on local properties as LaBrooy believes there are still many “reitable” assets in Malaysia. He said many companies were exploring strategies such as sale and leaseback, which would help release cash back into the business and operations. “In addition, we are proactively engaging with property developers or contractors to produce more reitable assets,” he added. Axis REIT, which owns 19 properties, has put on hold its acquisition plans until further capital can be raised. LaBrooy said the company had always tried to maintain a policy to cap its gearing level at 40%. He said its gearing level was at about 34% now, which means it can still borrow RM260mil. Axis REIT is also proceeding with refurbishment activities at three of its properties - Menara Axis, Nestle House and Crystal Plaza - which will cost about RM8mil. The refurbishment is aimed at attracting tenants and potential clients, and sustain asset valuations. Atrium REIT Managers Sdn Bhd chief executive officer Paul Lim said the earnings outlook for REITs for the first half year of 2009 was expected to be stable. “But beyond that I am holding (off) optimism (until) 2010. “The outlook is still unclear as the actual impact of the global financial meltdown is not yet felt, particularly on the rental squeeze (as) tenancies are still intact. Lower borrowing costs now may boost earnings a bit more. At the entry price today, our net earning per unit yield is in excess of 11%. “I think it’s attractive compared with fixed deposit rates, which (are affected) by the reduction in the overnight policy rate by 75 basis points to 2.5%,” he said. Currently, Atrium REIT is looking at logistics-based industrial assets. Although it was in preliminary discussion with a few potential landlords, it had no plans yet for new acquisitions so far, said Lim. For Hektar Asset Management Sdn Bhd, the manager of Hektar REIT, most of its income comes from leases to retailers. Its retail mall properties have achieved relatively stable income, with only 26% of Hektar REIT’s monthly income tenancies expiring in 2009, while the rest of the rental income is already locked for longer term. Hektar chairman and chief executive officer Datuk Jaafar Abdul Hamid said it would continue to focus on retail assets and grow its asset base via acquisitions. He foresaw huge opportunities in shopping centres throughout Malaysia as Hektar REIT only owned 1.1 million sq ft of shopping centre space now, compared with a total of close to 90 million sq ft of shopping centre net lettable area (space for rent) in Malaysia. Jaafar said Hektar REIT would develop new properties on a private basis through the group’s private company which is focused on developing retail assets as REITs are not allowed to develop new properties. “We aim to develop and own world class retail shopping centres serving the needs of ordinary Malaysians,” he said. Meanwhile, GLM REIT Management Sdn Bhd, the manager of Tower REIT, said it would continue to inject good quality and yield-accretive prime office assets in the Klang Valley into the REIT, but with greater caution and discernment. “Our growth strategy emphasises on value and focuses on prime office buildings while maintaining uncompromising criteria for new acquisitions,” says GLM REIT chief executive officer Chan Wan Leong. Tower REIT would continue to adopt optimal gearing levels and will actively manage the risks associated with changes in interest rates and capital markets, he said. Chan believed that the REIT sector was still at a relatively early stage of development as there were not many players and the challenge was how to attract more REIT players and investors into the market. “This in turn will improve liquidity and add vibrancy in the industry,” he said. While there are challenges, Tower REIT is confident the market will improve eventually, especially with the Government’s support through its stimulus packages and fiscal policies. PROPERTY companies are still expected to turn in decent earnings growth this year, and to certain extent in 2010, due to large unbilled sales brought forward from last two years. "Despite the resiliency as compared to the previous downturn, there is lack of re-rating catalyst for Malaysian property developers in the immediate term," ECM Libra Investment Research said in its weekly review of the property sector today. It said, however, the key risk now was the declining sales which would hurt earnings in later part of 2010 and beyond. "Our neutral call on the sector is maintained and we favour stock such as Sunway City now which has more stable property investment earnings as opposed to pure property developer," it said. Meanwhile, in a separate report, ECM Libra said it was cautiously calling an''underweight'' for the construction sector in view of order book replenishment risk. 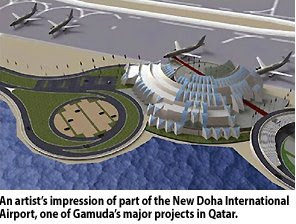 Gamuda Bhd, Malaysia's second biggest builder by market value, has been pre-qualified for more than RM10 billion worth of infrastructure projects in Qatar, a senior official said. It is also bidding for several infrastructure-related jobs in Bahrain and other Asian countries, Chan Kong Wah, the managing director of Gamuda Engineering Sdn Bhd, the group's construction arm, told Business Times. The builder has gained a strong footing in the Middle East since 2005, winning three major projects in Qatar and Bahrain, worth a combined RM4.01 billion. It has a RM2.6 billion contract to build the New Doha International Airport (NDIA), a RM760 million deal for the Dukhan Highway project in Qatar. It also has the RM650 million job for the Sitra Causeway Bridges. Gamuda has built a reputation for doing its work well, completing jobs ahead of schedule. This had led to an RM850 million deal for extension works at the NDIA. The contract, awarded in 2007, was to build new pavements, aprons and a tunnel, and for mechanical and electrical works. "There's possibly RM400 million (contracts) more to come (for the NDIA)," Chan said. It is now looking for more jobs in the Middle East as the Dukhan Highway project is almost completed. Work is due to finish by June 2009 and the highway will be handed over to the client, the Public Works Authority. As for the NDIA project, a joint venture between Gamuda, Sinohydro and WCT, it is 70 per cent completed and is scheduled to finish by February next year. Its Sitra project will also be completed by May 2010. CREST Builder Holdings Bhd wholly-owned subsidiary Crest Builders Sdn Bhd (CBSB) has proposed to acquire 2.532ha in Sungai Buloh, Selangor, from Saujana Triangle Sdn Bhd for RM37.113mil. The acquisition amount is to be satisfied by setting off the same amount against the total contract sum payable by Saujana Triangle to CBSB. In a filing with Bursa Malaysia, Crest Builder said the proposed acquisition provided an opportunity for it and its subsidiary to increase their landbank and to own a piece of strategically located land that could be developed. It was also to reduce part of the total amount receivable by CBSB from Saujana Triangle in the ordinary course of business. The proposed acquisition was expected to be completed by latest mid-2009, it said. PRICE correction or not, condominiums in the Kuala Lumpur City Centre (KLCC) area still command the highest price compared with those in other parts of the country largely owing to its significant appreciation in the past five years. Prices of newly launched condos in the vicinity have appreciated from RM500 per sq ft in 2004 to around RM1,000 in 2006 and RM2,000 in July 2008. And in August last year, prices peaked at just over RM3,000 per sq ft following the soft launch of The Binjai on the Park by KLCC Property Holdings Bhd. Other recent launches include the Regent Residences comprising 105 upmarket residences on top of the 5-star Regent Hotel in Avenue K with an average price tag of RM2,500 per sq ft. Since its soft launch in April last year, it has sold 60% of its units. The unveiling of the much-awaited luxury residential project – Four Seasons Residences – by Venus Assets Sdn Bhd scheduled for late last year was postponed due to weak market sentiments. The 173 super luxurious residences are touted to have built-up of 3,000 sq ft each with a whopping price tag of RM3,500-RM4,000 per sq ft. The latest KLCC project to be unveiled is The Binjai on the Park, which has chalked up a take-up rate of 20% since its soft launch last August. Offered under the build and sell concept, the residences are only offered to selected buyers. The 171 residences with built-up from 2,500 sq ft are priced from RM2,500 to RM3,200 per sq ft or RM5.5mil to RM10mil a unit. The super high-end residences offer direct view of the Petronas Twin Towers, direct access to the KLCC park, excellent quality finishes and management. Other future projects lined up include Millennium Residences, 6 Stonor and IMC Parkville. YY Lau Property Solutions chief executive officer Y.Y. Lau says the luxury residential market in the KLCC has gone up a notch with The Binjai project, and developers will have to pay more attention to finer luxury concepts in the future. Despite the apprehension over the property market’s outlook, Lau believes it’s a good time for serious buyers to scour the market for attractive buys. “They stand a better chance of negotiating a better deal for some prime properties in selected locations,” she says. 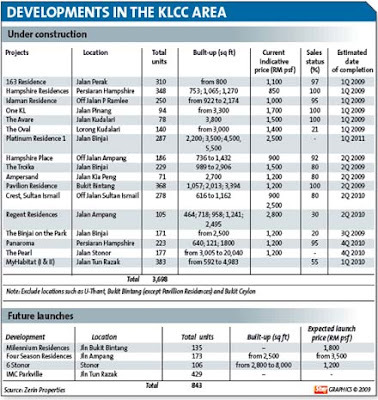 AMID the global financial crisis and waning demand for luxury high-rise condominiums, the coming onstream of 2,000 more condominiums from 10 projects around the Kuala Lumpur City Centre (KLCC) area this year is expected to result in further price correction in properties in the vicinity. After a euphoric two-year period which saw prices of some recently-released residences skyrocket to over RM3,000 per sq ft, the feverish pitch of high-end condominiums in the KLCC area appears to be cooling down. The devastating impact of the US-led global financial crisis is taking a heavy toll on the rest of the world and with it, asset and equity values have taken a severe beating. The wealth destruction has significantly weakened consumers’ confidence and their appetite for big ticket purchases such as properties. Since the middle of last year, prices of secondary residential properties in the KLCC vicinity have dropped 15%-20% while the rental market has eased 20%-25%. The slowdown was more visible in the last quarter of 2008 as reflected by shrinking property transactions. Industry observers are not ruling out further weakening in values and rental yields. Knight Frank Ooi & Zaharin Sdn Bhd managing director Eric Ooi expects the current lull to continue until buyers’ confidence is regained, at the earliest in the later part of the year. Even so, the general view among industry practitioners is that there is no price bubble in the KLCC residential market. In fact, he points out that there was still demand for KLCC properties in the last quarter of 2008, albeit at a slower pace compared with the third quarter. In addition, as there will be no new project launches in the next quarter, he expects demand to outstrip supply, hence stabilising prices somewhat. Fortunately for Malaysia, while much of the world (US and Europe especially) is reeling from the crisis with asset values yet to see a bottom from a free fall, there has yet to be a visible deluge of distressed assets for sale, owing much to the country’s resilience. 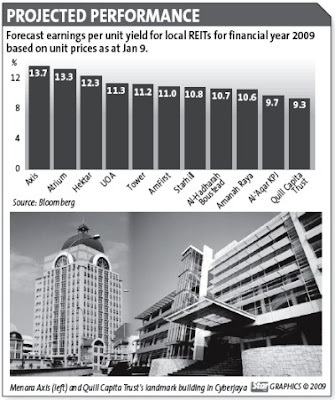 “Some foreigners may be selling at distressed prices but local vendors are holding strong. And despite the correction, prices of residential property in the KLCC area have not plummeted like those in more expensive markets. Coupled with demand from opportunistic investors looking for good bargains, there will still be a flow of transactions to sustain property values,” Yap opines. “The appetite for good value buys is pretty much the same,” he adds. There are also other plus points that the property sector can bank on, says ReGroup Associates Sdn Bhd executive chairman Christopher Boyd, citing declining interest rates which increases buyers’ affordability – a definite boon for the sector. “Values are way below those of comparable properties in most other cities in the region. There is still an influx of expatriates and as far as I know, there is a long waiting list at the expatriate schools,” he quips. On the other hand, he says foreigners who want to cash out may be willing to cut their asking price to make a quick exit. She says the market’s performance depends on a few factors, including the reputation and financial strength of developers and the investment objectives of potential buyers. “If a developer is positive and has deep pockets, has projects in choice locations and offer quality and well sought after property products, he can sit tight and weather the current unfavourable situation and come out a winner when the market stabilises and scale new highs,” Lau says. She admits that certain groups from South Korea and Britain have deferred their purchases while others who own existing properties are trying to unload given the severity of the crisis. In addition, due to the worsening property overhang in the Middle East, there is a marked fall in demand from Middle Eastern buyers for local properties since the last quarter of 2008. To woo foreign buyers, several developers have been holding road shows abroad in countries such as South Korea, Japan, Britain, China and India to take advantage of the competitive pricing. Zerin’s Yap says the establishment of Malaysia Property Inc to promote Malaysia as a property investment destination will definitely heighten interest among foreigners. “We expect property around the KLCC area to be the biggest beneficiary from this initiative,” Yap says. Several months ago, an acquaintance received a phone call from a developer who has a project facing the Petronas Twin Towers. The caller wanted to know if he was interested in a condominium which cost slightly less than RM3,000 per sq ft. The call proves one thing – that the brand of conspicuous consumption that some KLCC developers have been successfully marketing to wealthy clients is currently being severely tested as the global crisis sends many markets in a tailspin, wiping out wealth alongside it. Do not be mistaken. By no means has the iconic location lost its allure. It is just that the meltdown has given the sector and that location a new dimension. From London to New York to Dubai, the luxury residential market is hurting as the economic crisis deepens. Malaysia, nowithstanding the fact that we are seeing a slower effect of the crisis, will not be exempted. Knight Frank Malaysia executive director Sarkunan Subramaniam says the prices have dropped significantly since August and expects prices to drop further. The fall in value may be greater in some projects compared to others. For example, an analyst says the prices of DNP Holdings Bhd’s The Meritz has dropped 28%. But SK Brothers Realty Sdn Bhd general manager Chan Ai Cheng says it is a misconception that transacted prices within KLCC have dropped. “Prices within KLCC have not really dropped, at least not the transacted prices. When properties within KLCC were first launched, they were transacted between RM1,200 and RM1,400 per sq ft and sold out immediately,” Chan says. (Note: Some of the earlier projects like Stonor Park and Dua Residence were launched at starting prices of RM530 and RM600 per sq ft respectively in 2003/2004. Prices began their stratospheric rise as more developers entered the market). She adds that the quick flip allowed property owners the opportunity to cash out with higher re-sale prices. “Just because people feel that the properties would be worth so much doesn’t mean that the properties are actually worth that much,” she says. “Asking prices are today more realistic,” Chan says. Besides pricing, analysts and agents have raised other concerns like sliding yields and the burgeoning supply in the vicinity. These issues are not new or unexpected. They were on the back burner even as early as 2005 when developers were showing interest in the hotspot. Many had then questioned if Malaysia will have or be able to draw enough expatriates to occupy these 6,000-odd units. That question remains relevant up until today. As the meltdown unravels, these same issues have taken a new urgency of their own. Before going further, there are different definitions and perimeters of what constitute KLCC. Consider the different concentric circles with the Petronas Twin Towers at the centre. Some may consider Berjaya Central Park (by the Berjaya Group) and Cendana (IGB group) as occupying the outer circle and should be included as KLCC property. Others go no further than Persiaran Hamsphire behind Corus Hotel along Jalan Ampang. The Binjai (KLCC Properties Bhd) being on the KLCC Park itself is the closest to the core. However one may define it, there are several thousand units out there today which remain pitch black when night falls, a sign that it is not occupied. “If you look at the property market as a whole, over the past few years, compared with what’s happening in the global property market, we are late in coming. Property prices have not risen as significantly as in the US, where over the past six years, prices have doubled. The units in that location come in pretty large packages. Catering mostly to families, they have a built-up of about 2,000 sq ft or more. In absolute terms, a unit can cost between RM2mil and RM3mil each or even more. There are some Malaysians who are sitting on piles of cash and are waiting to pick up some units if the price is right. Because the gap between the selling price and asking (buying) price is today too wide, some of the owners have decided to move into that location. Agents and property consultants say it has become increasingly difficult to get tenants, especially in the last half of 2008 and the situation is expected to remain the same for the first quarter of this year. Industry observers suggest that developers within the KLCC area who have yet to launch their projects should hold out for a bit before they do so as the weak market could translate to weaker sales. “But if they need to launch, they could scale down the projects or offer smaller units hence bringing down the price,” says one observer. Will developers revise the prices of their properties downwards due to waning demand? Not likely. “Once developers have set or raised their prices, it will not be reduced. The market does not practice this,” she says, adding that developers may provide more value add or give out freebies to woo buyers. It is becoming more difficult for developers to close sales these days and the growing number of easy financing schemes and freebies being offered by developers drives home the point that the property market is becoming increasingly tough for industry players. Buyers are taking longer to decide as the scale and severity of the global financial crisis begin to dawn on the people. The performance statistics being rolled out by manufacturers, exporters, corporations and service providers have been pretty weak, which further create anxiety about the state of the economy. News of major retrenchments by companies, especially multinational corporations, are unnerving to many Malaysians and they worry whether they will be the next in line. Many are bracing for more bad news as they believe the worst has yet to unravel going by the scale of damages reported across the continents. People are postponing purchase decisions for big ticket items, including property and cars, as they fear more bad news ahead. The biggest challenge for developers this year is to regain buyers’ confidence and developers have to be proactive by showing their commitment to their projects, which include putting up the necessary infrastructure ahead of a project’s launch. To encourage buyers to sign on the dotted line, developers have came up with an ingenuous plan by working with their panel of bankers to provide easy financing schemes to purchasers. Even the top gun developers of SP Setia Bhd and Mah Sing Group Bhd have joined in the bandwagon with their 5:95 home loan packages. Depending on whether it is a 10:90 or 5:95 scheme, buyers only have to fork out either a 10% or 5% of the purchase price as downpayment after choosing a property while the bank will release the progressive payment to the developers during the construction period. The developers will bear all legal fees, stamp duty on the sale and purchase agreement, loan agreement and memorandum of transfer and also service the interest during the construction period. This way, the buyers will not have to fork out money to service the loan until the property is completed and handed over, which typically takes two years for landed properties and three years for high-rise projects. Some, like Gamuda Land, have gone the extra mile. It has accorded buyers another “honeymoon year” once they’ve taken over vacant possession, afterwhich they will have to start servicing the loans. As property development is ultimately a business that calls for efficient cash flow management, these financing schemes will ensure developers have enough cash flow to finance their projects during the construction period. Having buyers sign up loans for their property purchase will also lower the risk for the developers as the buyers will have to answer to the banks should they decide not to proceed with their purchase. As for the financial institutions, the arrangement will ensure they are able to meet their loans growth target. In fact, total loans approved for residential property purchase nationwide dropped by 23.3% to RM3.69bil last December compared with the same period in 2007. It is imperative for buyers to put some serious thought before taking the leap to sign up for a financing facility as once a loan agreement is sealed, they are committed to the loan repayment. Important factors to bear in mind - one’s affordability, developer’s reputation and suitability of purchase. On the other hand, it will also help if developers undertake feasibility studies to ensure there is demand for the type of products they are offering. * Deputy news editor Angie Ng hopes to see more Malaysians having the opportunity to buy homes as a robust housing industry has huge spin offs on the country’s economy. Every company knows the importance of brand image and the vital role it plays in defining awareness and distinguishing it from its competitors and the rest of the industry. In the case of the IJM brand, its association with the construction sector is so well known that not many realise that it has also been involved in property projects for quite a while, IJM Land managing director Datuk Soam Heng Choon says. “Most people know IJM group as a construction company (IJM Corp), which is our core business. “But under the IJM stable there are also three other listed companies, namely IJM Land Bhd, IJM Plantations Bhd and Industrial Concrete Products Bhd (a product manufacturer),” he tells StarBizWeek. IJM Properties Sdn Bhd, the property arm of IJM Corp, has been selling properties for many years, especially within the Klang Valley, Penang and Johor. In 2007, it acquired RB Land Holdings Bhd to fortify its position as a property player. Then, in September last year, the group initiated a rebranding exercise to create awareness that it was more than just a construction player. “We embarked on the (rebranding) exercise to streamline our property business into one entity – IJM Land Bhd. “We wanted to communicate to customers that we were also developers. Customers are more likely to purchase property from a reputable developer rather than a reputable contractor,” Soam says. “Within the KLCC area, you can see the IJM logo on some of the tower cranes because we are the contractors for a few of the projects there. “But within the area we also have a project that we are developing ourselves. If we retained our former logo which just said ‘IJM,’ people would think that we are just the contractors,” Soam says. The company’s rebranding initiative continues into 2009 and the next step is to address the mindset of its employees, says Soam. He admits that it would take time for everyone to accept the company’s new image and objectives, especially its own employees. “We have people who have been with the construction side for quite a long time and the expectation of being just a developer is different from being just a contractor. “As a contractor, you just build and that’s it. But as a developer, you have to consider various issues such as the design, quality of the product, customer service, complaints and the maintenance,” Soam says. He adds that the company incorporates a lot of forward thinking elements into its designs when working on a particular project. IJM Land has a landbank of nearly 10,000 acres spread all over Malaysia. It has projects in Penang, Negri Sembilan, Johor, the Klang Valley, and Sabah. About 60,000 acres are undeveloped. “We have about 40 ongoing projects in Malaysia,” Soam says. The company currently has about 300 employees. It is also one of the largest property developers in Malaysia in terms of asset size. On the outlook of the local property market, Soam says: “I think it’s a foregone conclusion. The market is getting softer. MK LAND Holdings Bhd, controlled by developer Tan Sri Mustapha Kamal Abu Bakar, is optimistic of achieving RM20 million in net profit for its current fiscal year, boosted by land and property sales. The developer expects sales to surpass its initial target of RM350 million. It made a net profit of RM10.1 million in the six months ended December 31 2008, against a net loss of RM18.3 million in the same period of 2007 while revenue doubled to RM125 million. Mustapha Kamal said MK Land will be able to repeat a similar performance in the second half of its financial year. The confidence is built on its recent land sale (9.2ha) at its Damansara Perdana township in Selangor, for RM150 million. It also sold RM150 million worth of residential and commercial properties at the township in the past seven months. "MK Land has turned around, thanks to the group as a whole. We have turned losses into profits. We are going on the road to recovery. It would mean that the structure we have, seems to be working," he told a news conference in Damansara Perdana yesterday. Mustapha Kamal, who returned to helm MK Land in June 2008 after a brief spell with his private companies, had outlined the details of a three-year plan to rejuvenate the company last year. Four people were roped in from Emkay Group, and its 75 per cent unit, Setia Haruman Sdn Bhd, the master developer of Cyberjaya, to handle specific tasks such as strategic planning, cash flow, and projects in the south and north. MK Land is aiming to launch five major projects over the next 3-5 years, worth RM4.1 billion collectively. They are North West Corner, Armanee Terrace Condo and Metropolitan Square in Damansara Perdana, Armanee Condo in Damansara Damai, and Jelapang One in Ipoh, Perak. MK Land will use RM73 million from its RM150 million land sale to kickstart the projects. Mustapha Kamal said cash from the operations are being earmarked to repay its final bond of RM60 million, due in June. However, in case cash from the operations are not received on time, it will utilise from the balance of RM77 million, to pay for the bonds, he said. "We recognise that there is a slow down in the property market as a result of the current economic downturn. "But with excellent location and value-added products, we are sure they will sell through aggressive sales strategies. We have what the market wants," Mustapha Kamal added. MK Land has 2,710ha of land, which will be able to generate as gross development value of almost RM20 billion. SINGAPORE: Genting International Plc, which is building a casino and theme park in Singapore, said the opening costs for the so-called integrated resort will have a "significant" impact on its earnings this year. Genting expects to increase its investment in the resort to S$6.6 billion (S$1 = RM2.39) from S$6 billion, the company said in a statement to the Singapore Exchange. The additional investment will be funded from cash flow once the casino resort opens, it said. The company yesterday reported it had a loss of S$124.8 million, or 1.38 cents a share, for the year ended December 31, compared with a loss of S$382.8 million, or 5.51 cents, in the year-earlier period. Sales fell 14 per cent to S$643.8 million as revenue from its UK casino operations dropped. Genting said the Singapore casino is "on track" to open by early 2010 and more than S$4.5 billion in construction contracts have been given out for the resort, which will include Southeast Asia's first Universal Studios. Genting International is a unit of Kuala Lumpur-based Genting Bhd, Asia's largest casino operator. KUALA LUMPUR: Sime Darby Property Bhd, a wholly owned subsidiary of Sime Darby Bhd, yesterday opened the Putra Heights Interchange, linking the area’s existing population to key townships and the Kuala Lumpur International Airport (KLIA) via the Elite Highway. The completion of the 3km interchange, which cost Sime Darby Property RM65 million, would cater to the existing 28,000 population of Putra Heights and future residents, said Sime Darby Property’s managing director Datuk Tunku Putra Badlishah. The residential area is expected to have a population of 60,000 residents when it is fully developed by 2016. The interchange, which adopted a closed-toll system, would lead to Putrajaya, Cyberjaya and the KLIA via the Elite Highway. The Elite Highway is operated by PLUS Expressways Bhd. Speaking at the launch of the Putra Heights interchange yesterday, Works Minister Datuk Sri Mohd Zin Mohamed said the interchange would facilitate a smoother traffic flow for residents in the area. Meanwhile, it was reported that PLUS had proposed to raise toll rates by 5%, where the increase would see the average toll rate to rise to 14.96 sen per km from the current 13.6 sen per km. When asked on the toll hike, PLUS’ managing director Noorizah Abd Hamid declined to comment, citing that it was “up to the government to decide”. Under the concession agreement, PLUS was to have a 10% increase in toll rates for three years beginning Jan 1, 2008 up to 2010, or the government would have to compensate the concessionaire. PLUS last raised its toll charges in 2005. According to Sime Darby Property, the Putra Heights dual carriageway interchange was the second project built and fully funded by the company after a “trumpet” interchange along the Damansara-Puchong expressway, which is adjacent to the UEP Subang Jaya development. “Putra Heights is an important and successful development for Sime Darby property. Hence we had committed to construct the interchange at our costs even though this was not a requirement by the authorities,” said Tunku Putra Badlishah. Putra Heights is a freehold development launched in 1999. To date, over 6,400 unit of mixed properties comprising 5,000 double-storey link homes, 56 bungalow lots, 324 shop-offices and some 1,400 units of medium-cost apartments had been built in Putra Heights. KUALA LUMPUR: Shanghai’s industrial property is fast losing its shine as the manufacturing sector bears the brunt of weakened demand, renminbi appreciation and rising cost of operations. With the average price of industrial properties moving south, gross yields are expected to rise to around 10% this year. While the government’s value-added tax (VAT) reform from production-based to consumption-based this year will stimulate investment, the impetus will be constrained by weak demand in the near term, said Hingyin Lee, the director of research and advisory of Colliers International, East China division. Lee sees demand for premium quality warehouses and build-to-suit workshops staying firm. More companies will opt for the sale-and-leaseback model to reduce risk. The vacancy rate in major industrial parks will hover at a low level. Average rentals are expected to be sustained by a relative scarcity in supply of high-quality warehouse facilities, said Lee. DHL has decided to build a North Asia hub in Shanghai Pudong International Airport. This comes on the heels of the opening of a new international hub at the airport by UPS. Meanwhile, the average rental of office buildings in business parks will be pressured from new supply coming onstream and a marked rental dip in the Grade A office market. PETALING JAYA: Aeon Co (M) Bhd has entered into a sale and purchase agreement to acquire 2.5ha of land and property for RM107.2mil from Kuala Lumpur City Hall. The purchase comprised RM27.2mil in land cost and RM80mil in building cost to be built in the future. The land forms part of a township called Bandar Sri Permaisuri. In a statement to Bursa Malaysia yesterday, Aeon said the acquisition would be fully satisfied by cash and financed through the company’s internal funds. “The acquisition is in line with Aeon’s corporate strategy of accelerating the expansion of its retail business through opening of new shopping centres and outlets,” it said. This acquisition is not expected to have any impact on the earnings per share, net assets per share and gearing of the company. There will be no change in the share capital and major shareholders’ shareholding of the company. SINGAPORE: Genting International expects to invest another S$590 million (US$385 million) in its Singapore casino resort project due to open in early 2010, the company said today. The extra funds to be pumped in by the company, which is part of Malaysian gaming conglomerate Genting Bhd, will bring its total investment in Resorts World at Sentosa to S$6.59 billion from S$6.0 billion, it said. Genting said the extra investments were required because of further changes made last year aimed at increasing the appeal of the casino project now under construction. “In the course of the past year, changes have been made to the design and architecture of the integrated resort to substantially improve its entertainment and fun offerings, including enhancements to its casino and Universal Studios Singapore,” Genting said in the statement. “Improvements were made to the quality of interiors as well as foot traffic accessibility to retail and dining outlets,” it said. Resorts World at Sentosa, one of two casino projects now under construction in Singapore, will include hotels and a host of family-friendly attractions including the first Universal Studios theme park in Southeast Asia.